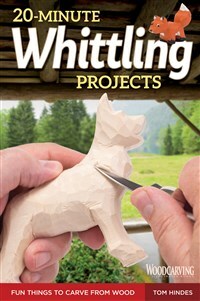 Learn the fast and simple way to whittle in this fun introduction to woodcarving. Discover how to whittle in less time while you have more fun! One of the joys of whittling with a pocket knife is that you can do it just about anywhere. You don’t need any fancy equipment… and you don’t even need much spare time. Author Tom Hindes demonstrates his easy-to-learn, quick-cut method for whittling expressive little figures from wood in just 20 minutes or less. With his friendly instructions and step-by-step photos, you’ll learn to carve an endless array of charming wizards, gnomes, gargoyles, ornaments, dogs, leprechauns, and more. These super-short projects are perfect for learning basic caricature carving skills. They also make wonderful little gifts for random acts of kindness. Leave one along with your tip at the local restaurant, or give one to your favorite cashier. Children especially enjoy receiving them as souvenirs. Tom Hindes is a whittling artist and carving teacher. He is a regular contributor to Woodcarving Illustrated magazine.